Agencies in recent years have discovered elephant tusk trafficking cases, in which tusks were brought to Vietnam in disguised containers before they are shipped to other countries. On October 4, 2018, the Anti-smuggling Team No 2 and the police, after examining an imported scrap container, discovered a large number of elephant tusks. The number of elephant tusks found was so big that the tally only finished at midnight. Officers seized two tons of elephant tusks and six tons of pangolin scales. The container of prohibited goods was carried by Lindavia ship which docked at Da Nang Port on September 29, 2018. The consignment departed in Nigeria and was declared as containing scraps. The importer in the waybill was Thien Truong Su Co Ltd headquartered in Quy Hop district of Nghe An province. However, by October 4, 2018, the company had not made customs declaration about the imports and had not issued documents on refusing the imports. The prohibited imports were discovered before they got customs clearance. When customs agencies contacted the importers at the addresses shown on waybills, the importers all refused the imports. As a result, agencies could only find and seize prohibited goods, but could not discover the goods owners. The elephant tusks were hidden in hollow logs of wood and covered with wax, plastic glue, kaolin and sawdust to create homogenous blocks which could fool scanners. In the black market, the tusks cut into pieces used to make fine arts and jewelry are priced at VND15-20 million per kilogram. Meanwhile, pairs of intact tusks can be valued up to billions of dong. They are mostly sold to people who want tusks for interior decor at their villas. As elephant tusks are expensive and displaying tusks is not a tradition of the Vietnamese, they are not popular in Vietnam. Vietnam is just a transshipment point for elephant tusks to transit before they are shipped to other countries. Reports show that many cases discovered by Vietnam’s customs agency had relations with products under the mode of temporary import for re-export later. 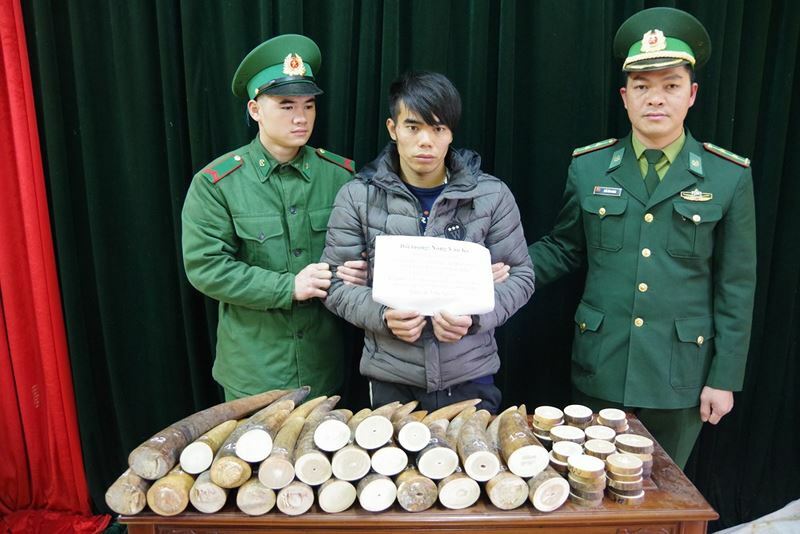 Most recently, the Cao Bang police caught Nong Van Ky, born in 1993, illegally carrying elephant tusks to China, seizing 25 elephant tusks and 52 tusk pieces, weighing 51 kilograms in total. In March 2018, the Dak Lak police discovered Dinh Thi Viet Ha, 31, in Buon Ma Thuot City driving a motorbike carrying 4.7 kilograms of bracelets and neck straps, suspected as being made of elephant tusks. When examining Ha’s house, the police found machines used to make products and another three kilograms of elephant tusk products.